It is always the little stuff that takes time to get right even though it goes against my nature. I love seeing massive changes and in the case of Project Nomad there have been a number along the way that really stood out. 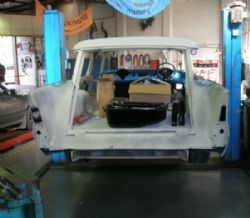 The body blasted, the new floor installation, the car in primer. Since the car has gone over to Quickfit Motorsports at Hornsby Anthony has been tweaking a few things that needed to be sorted that fall into the little stuff category. 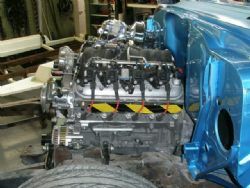 Putting the motor back in aside, the little stuff has included the rod for the brake booster, the cable for the handbrake, the steering knuckles and bar, fuel lines, the petrol filler and custom pipe, tweaking the cross member for the transmission and refitting the rear calipers to check for clearance. The brake booster had been mounted on the firewall and the pedal box installed but the rod to connect it all up had to be fabricated as we are mating an original fifties piece with the new twenty first century booster. 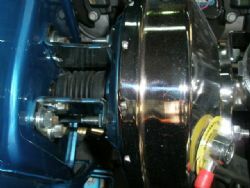 That all went smoothly and better still there is ample clearance between the valve covers, engine and booster. The handbrake bracket had been installed at Joscar and now there is neat hole through the floor that contains the lead cable section to get the handbrake working. A new cable will need to be fabricated to attach to the disks on the diff to ensure it not only works but will pass rego as well. With the disk brake kit came four rated braided hoses to connect to the chassis and these are now installed along with the petrol filler cap and a custom made pipe to run down to the eighty litre tank out of a Statesman. 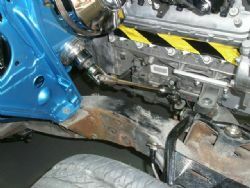 The cross member to hold the transmission in place needed a little tweaking as the tunnel shape had altered slightly with the addition of the seat and handbrake brackets. A small spacer provided the cure for the clearance issue and this will be welded to the chassis when the body comes off. The good news about this visit was there is plenty of clearance for the rear brake calipers alongside the American Racing wheels. Before I went and got a wider set of rims for the rear I needed to ensure the backspace was not going to foul on the calipers. Due to the shortened nine inch diff I can now order the 17 x 9.5” with a three inch backspace which will fill out the rear wheel wells with a nice deep dish rim and provide plenty of traction. The eights that currently sit in the rear will be put on the front with the hope that the handling characteristics will be twenty first century as well.